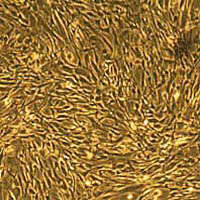 Lifeline's normal Human Aortic Smooth Muscle Cells (HAoSMC), when grown in Lifeline's VascuLife SMC Medium, provide an ideal low serum (5%) culture model for the study of angiogenesis, atherosclerosis, diabetes or vascular biology. Lifeline's HAoSMC are cryopreserved as secondary cells to ensure the highest viability and plating efficiency. Our HAoSMC are quality tested in VascuLife SMC Medium to ensure optimal low serum growth over a period of at least 15 population doublings at rates equal to or greater than other serum-supplemented media.